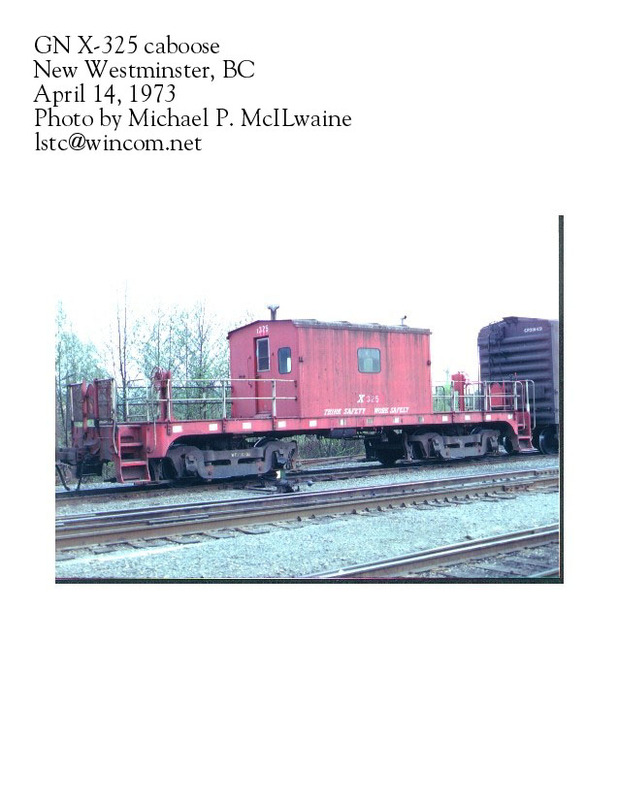 This page contains GN Cabooses in the X-301 to X-757 group. 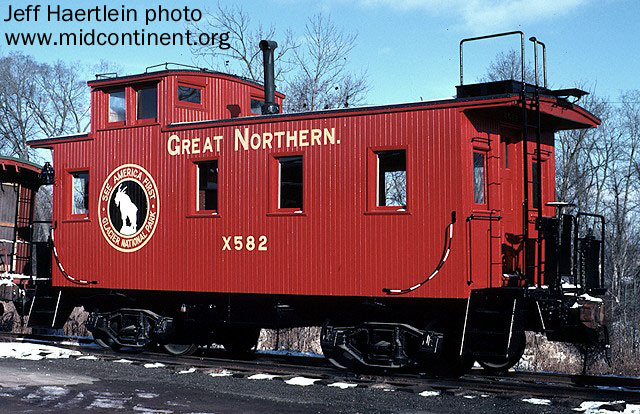 CLICK HERE for GN Cabooses in the X-1 to X-300 group. 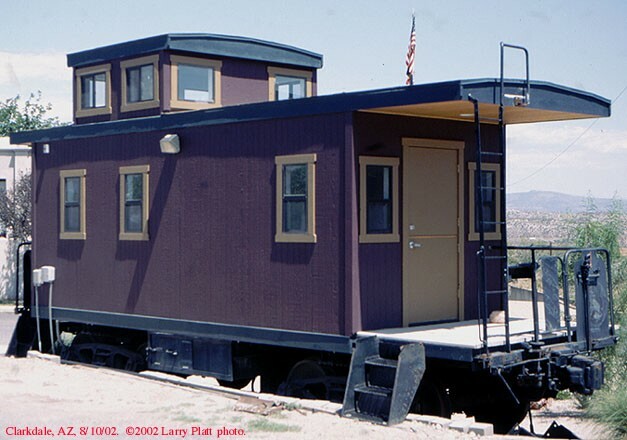 CLICK HERE for GN Cabooses of uncertain number/origin. 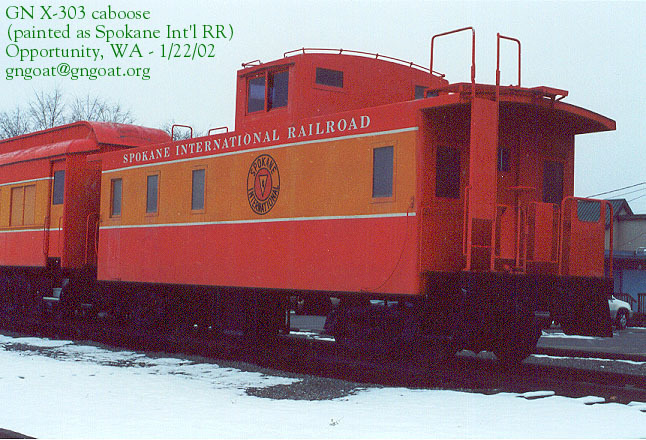 X-303 - Painted up in a red/orange Spokane International Railroad scheme, this caboose can be found at Opportunity, WA (east of Spokane). 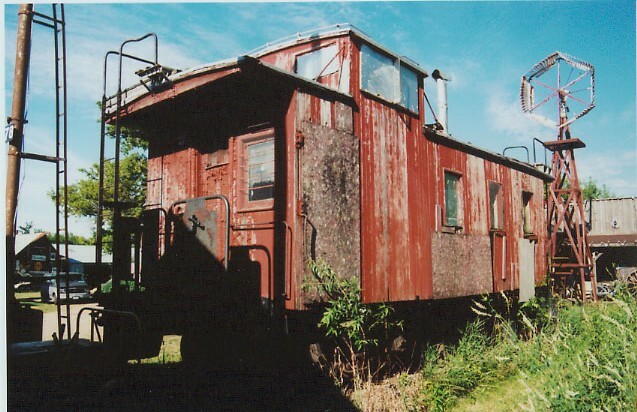 This caboose is coupled to an E unit and heavyweight Pullman on a short section of track and is used as a "John Ryan - Dentistry For Children" office. 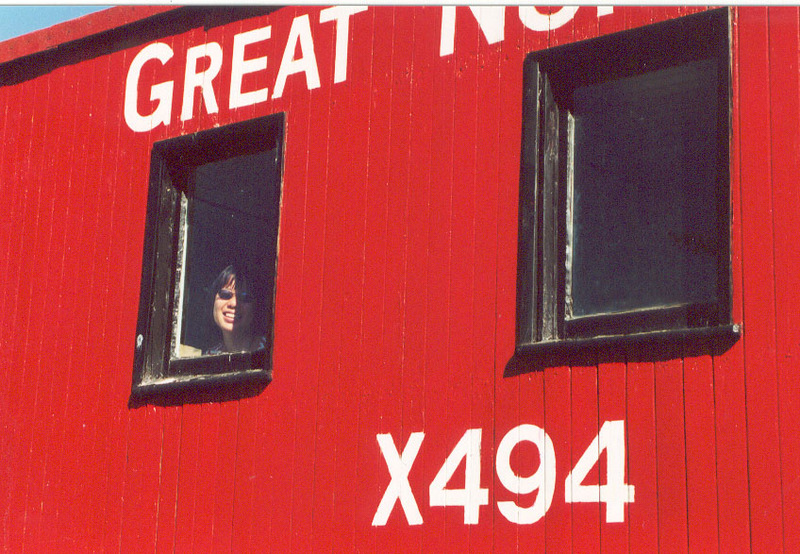 Photo taken in January 2002 by Lindsay Korst. 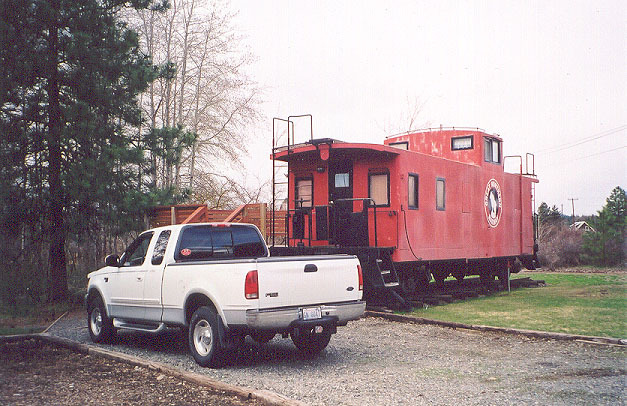 X-304 - Last listed as sold to "NW Steel Rolling Mills", this caboose was brought to my attention by Terry Whitcomb of Yelm, WA. 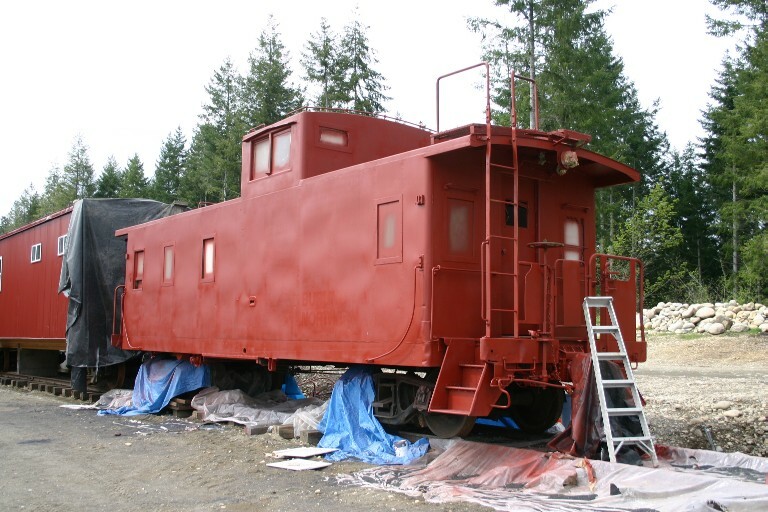 It is being restored and will be repainted for use at a privately-owned outdoor facility. 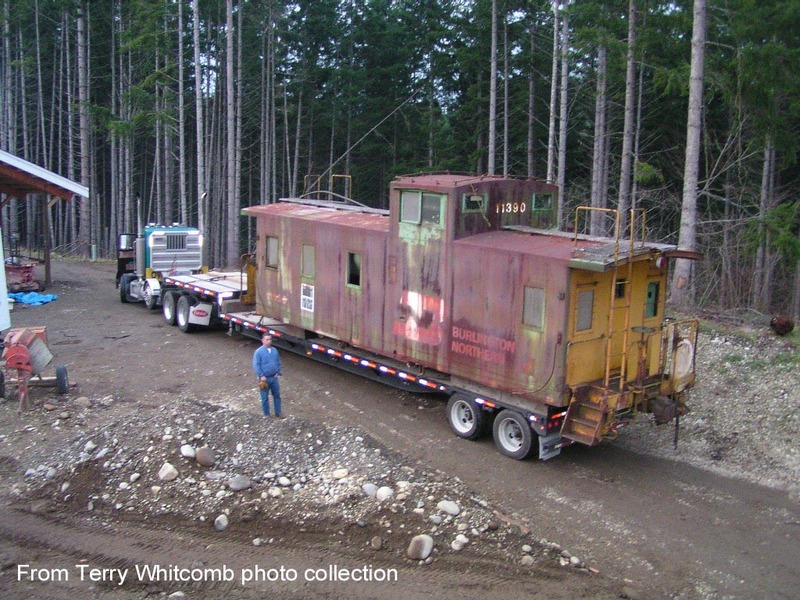 First photo of caboose being moved is from the collection of T. Whitcomb. 3 primer-red photos taken in April 2005 by Lindsay Korst. 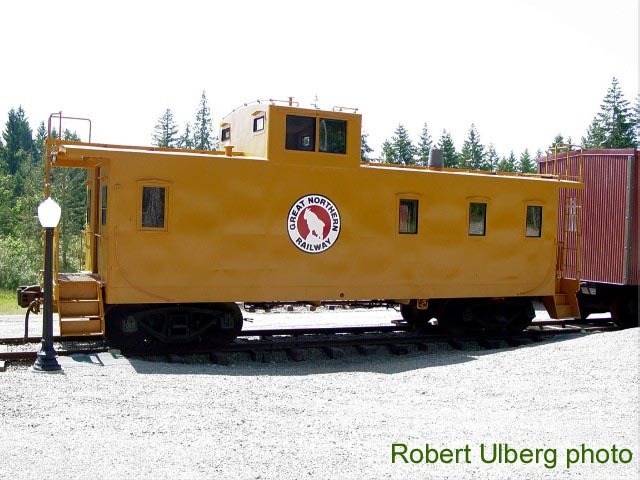 Update: On May 28, 2005, Robert Ulberg took this photo of freshly-painted X-304 caboose...in GOLD! 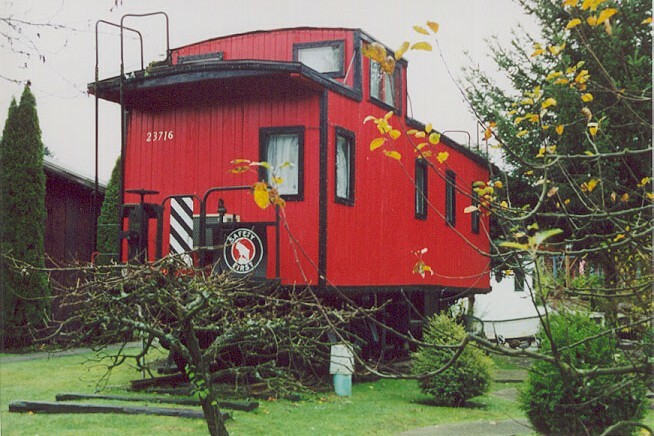 X-307 - Available for rent as a cozy cottage is this ex-GN caboose. 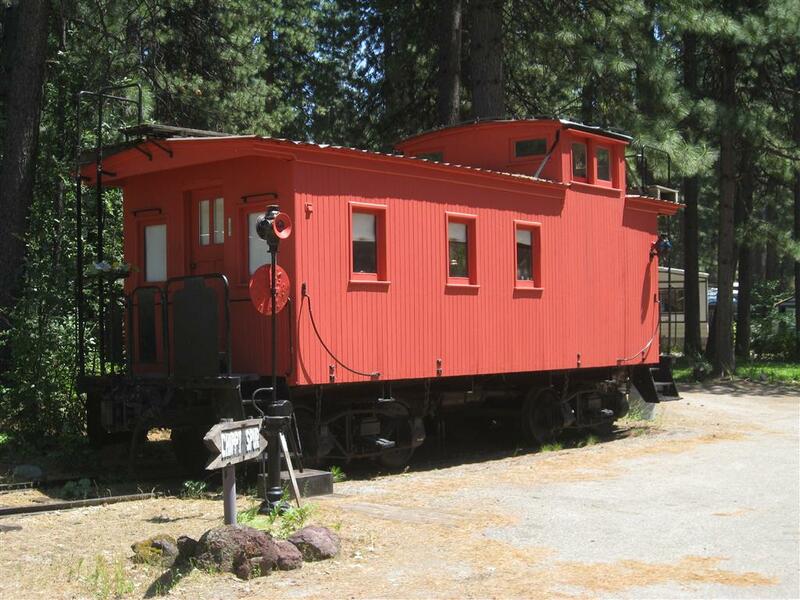 Location is South Cle Elum, WA at the Iron Horse Inn Bed and Breakfast. 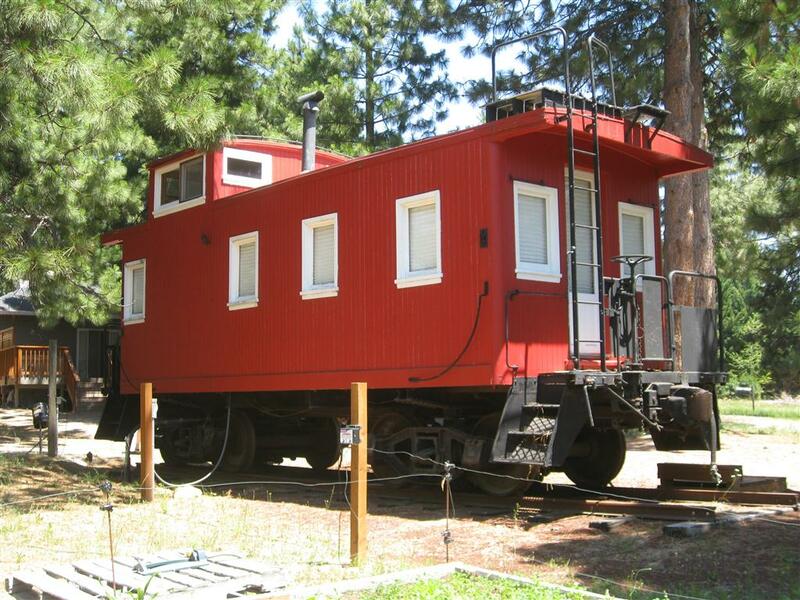 The Inn also has two other cabooses for rent. 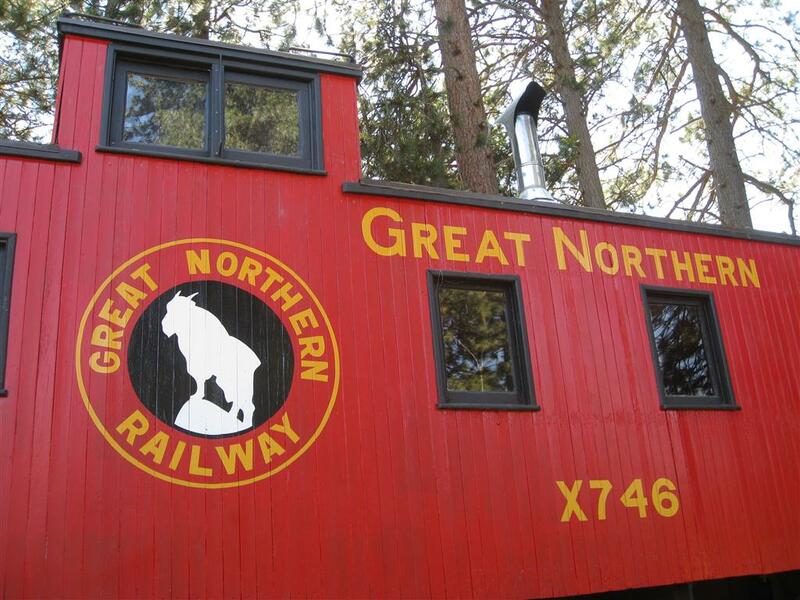 The Inn itself was a former CMStP&P hotel for crews on Snoqualmie Pass. 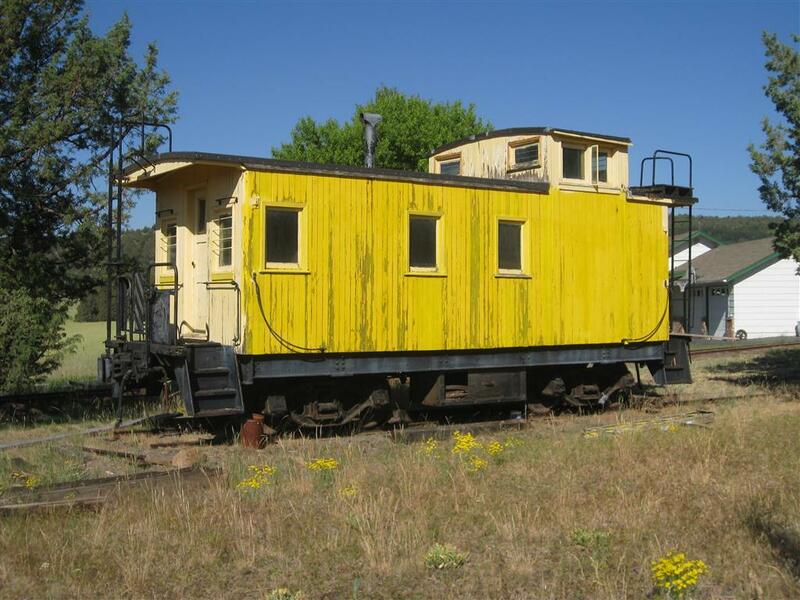 Nearby is the former Milwaukee Road depot and electrical substation both under restoration. Thanks to Doug and Mary Pittis, the Innkeepers for supplying me with details of their operation. Be sure to stay at the Inn next time you're in the area. 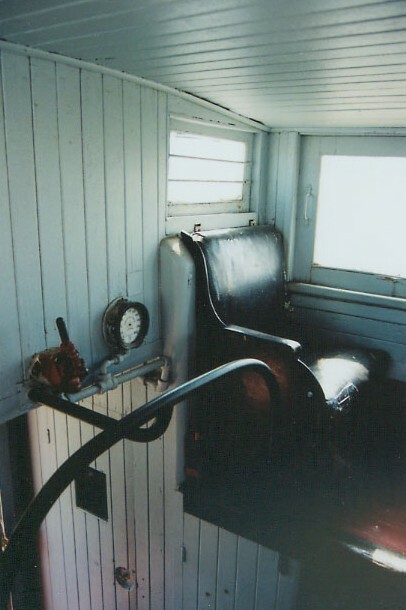 Photo taken in April 2002 by Lindsay Korst. 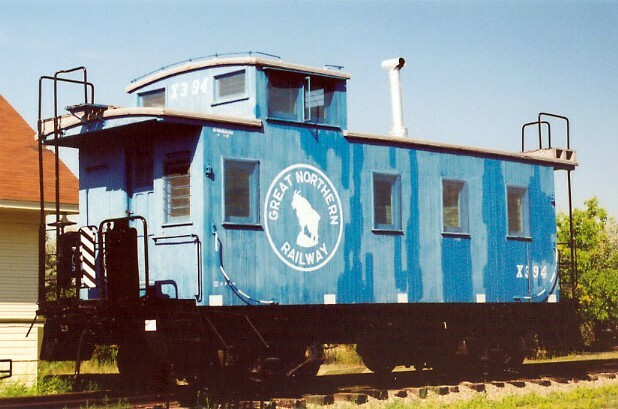 X-308 - Located way, way out in the boonies of North Dakota (Dresden, ND) is this former GN caboose in BN colors. July 2003 photo by Lindsay Korst. 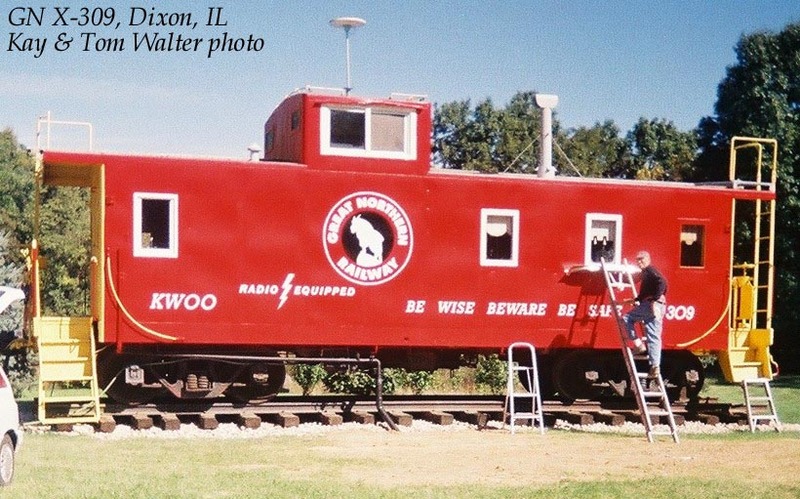 X-309 - Freshly repainted is this stunning GN caboose at Dixon, IL. Owned by Kay and Tom Walter. 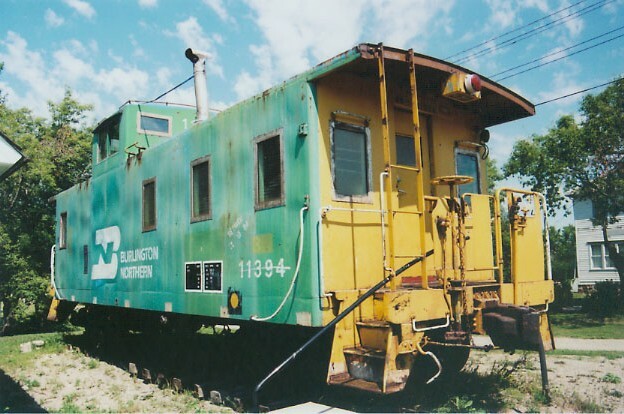 X-320 - According to the 1973 BN Motive Power Annual, this caboose started out life in 1927 as GN boxcar #31474, was converted to transfer caboose X-175 in 1962, and renumbered to X-320 in January 1970. 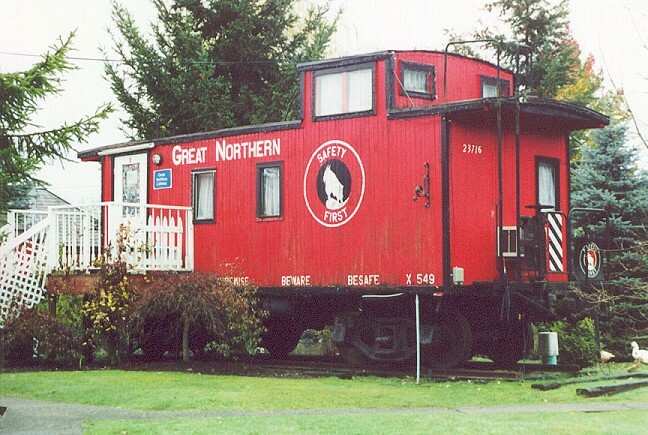 Photographed by Robert Bowman near Chesaw, WA in 1999. X-325 - This photo was taken on April 14, 1973 by Michael P. McILwaine at New Westminister, BC, CANADA. 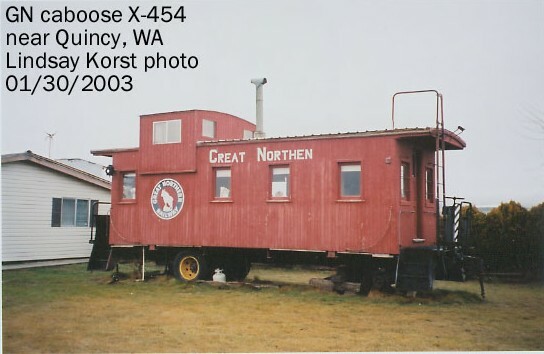 X-351 - Located in Wilkeson, WA and disguised as an NP caboose (whose tracks ran nearby), it is used as a local meeting room. January 2005 photos by Lindsay Korst. Note: Thanks to Bob Ulberg for finding it and Ben Ringnalda for posting it on GN Empire. That's how I heard about it. 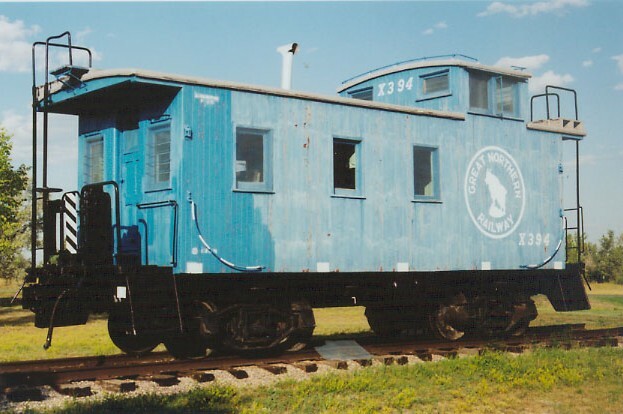 X-394 - Located at a museum north of Williston, ND, this caboose shares space with the depot moved from Alamo, ND. July 2003 photos by Lindsay Korst. 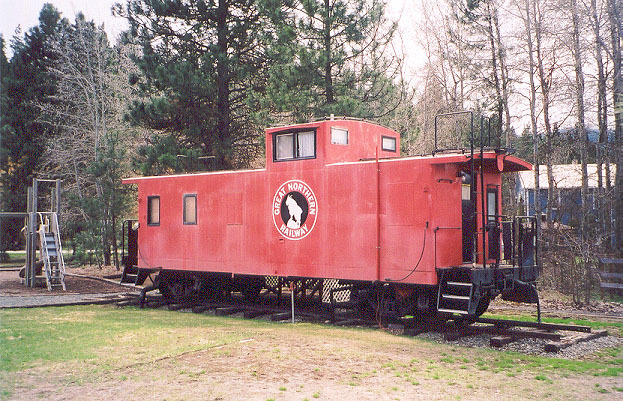 X-408 - Located in a Eureka, MT museum, this caboose sans cupola was renumbered to BN 10927. July 2004 photos by Lindsay Korst. 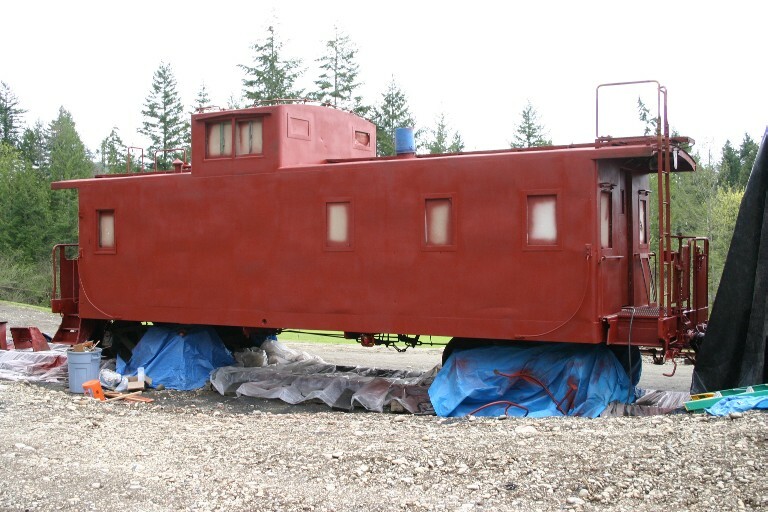 Update: Courtesy of Dean Kershner are these more recent pictures of the X-408 having just been repainted. Nice shots! 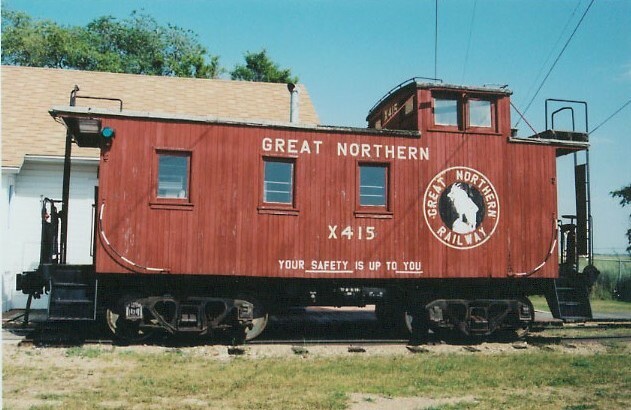 X-415 - This beautifully-restored caboose can be found in the Pioneer Museum in Rugby, ND. 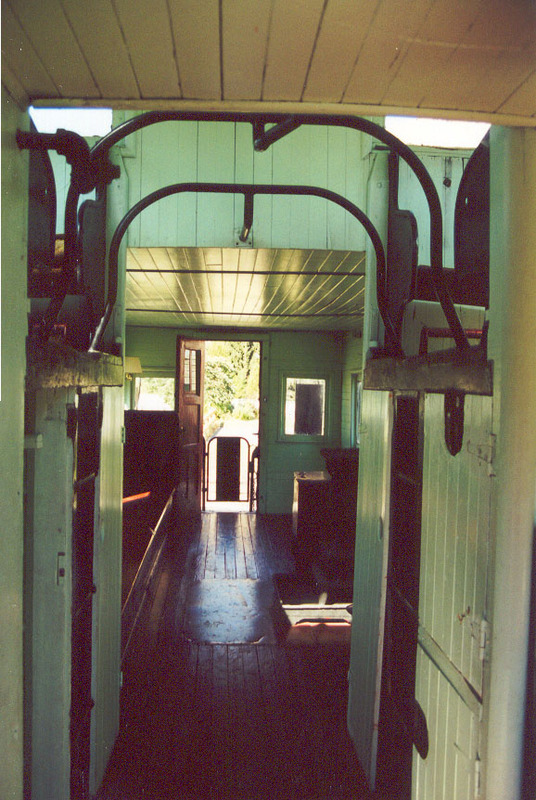 Photo taken by Lindsay Korst in July 2003. 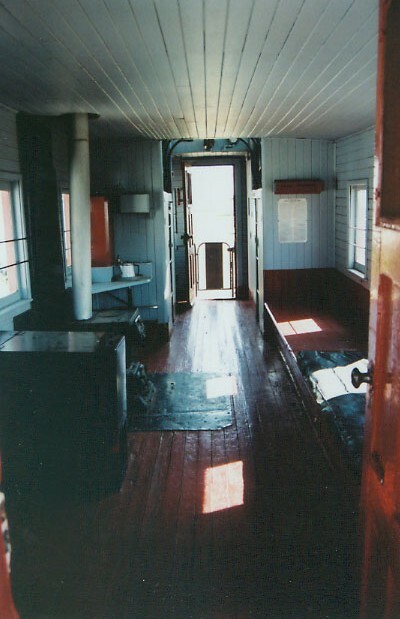 Additional pictures are of the interior. 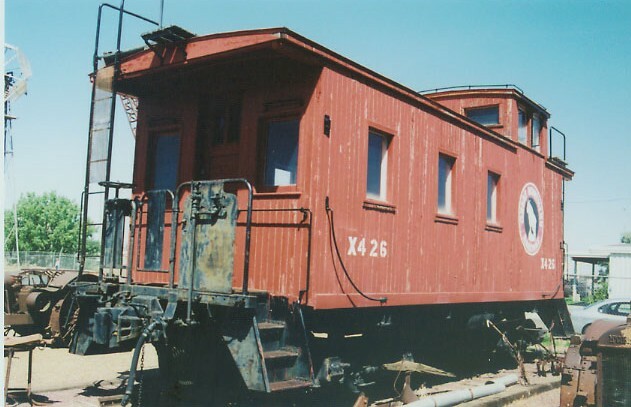 X-426 - Located in a Glasgow, MT museum. July 2003 photos by Lindsay Korst. X-433 - Located in a trailer court in McCloud, CA. July 2012 photos by Lindsay Korst. 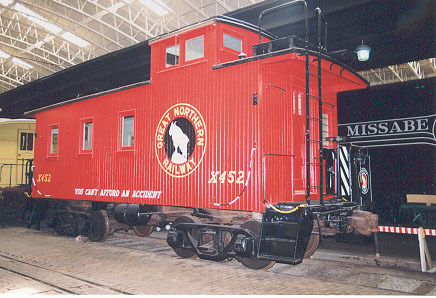 X-452 - Located in the Lake Superior Transportation Museum, Duluth, MN. 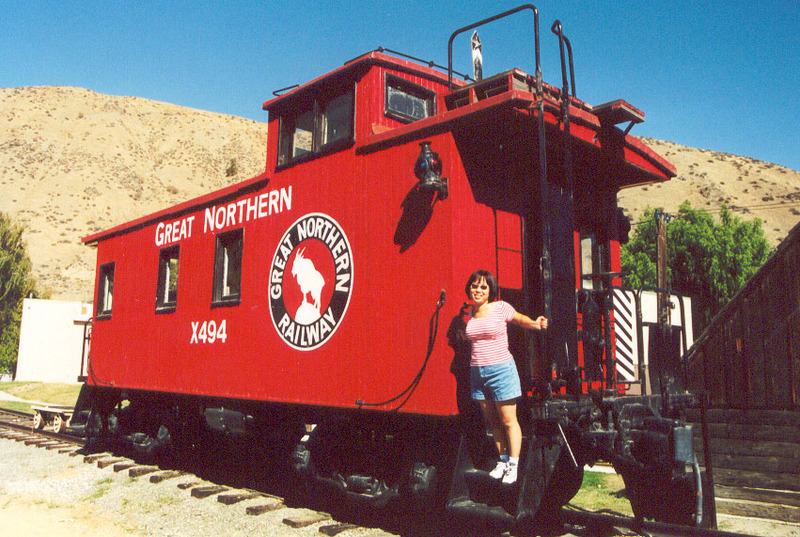 Photo taken by Lindsay Korst in July 2001. 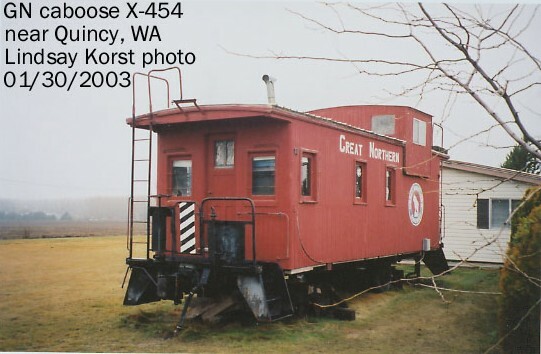 X-454 - Near Quincy, WA on private property resides this caboose sans trucks. Note the spelling "Northen" on one side. Photos taken in January 2003 by Lindsay Korst. 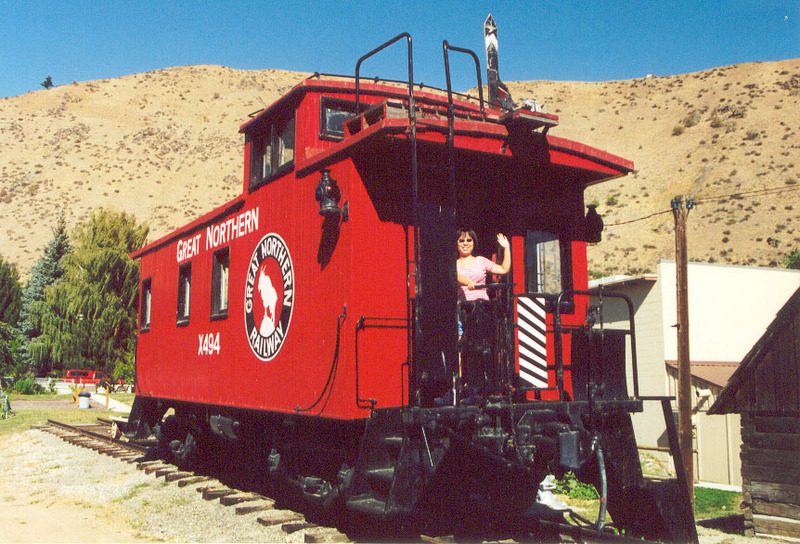 X-485 - Painted for Montana Western, this ex-GN caboose is located at the RV park in Havre, MT. X-494 - On exhibit at the museum in Cashmere, WA. Photos taken by Lindsay Korst in September 2001. 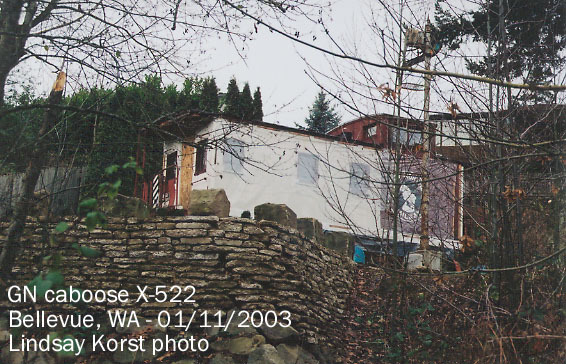 X-522 - Located in a Bellevue, WA neighborhood, this photo was taken by Lindsay Korst in January 2003. Update: During Ben Ringnalda's visit in July 2004, we visited the X-522 and were given a tour by the owner. Thank you, Mr. Bartl! Photos by Lindsay Korst. 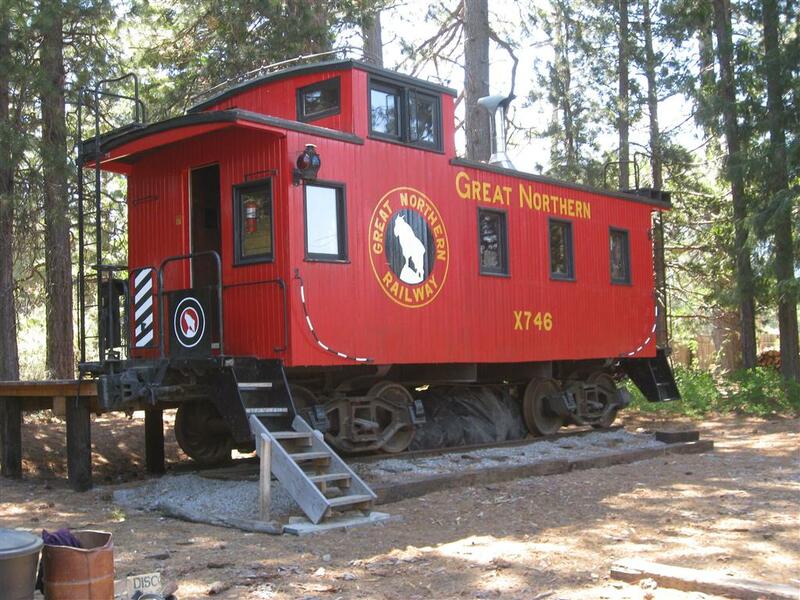 X-536 - This replica is built on the frame and trucks of Great Northern caboose X-536. It is on display in downtown Clarkdale, AZ. 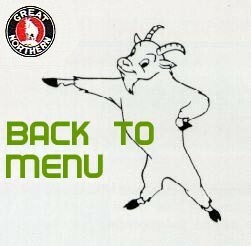 8/10/2002. A Larry Platt photo, used with permission. 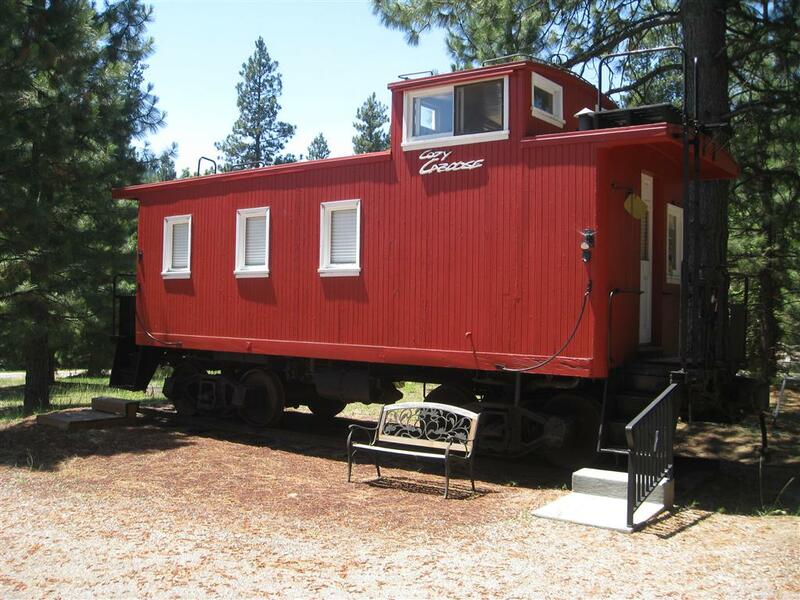 X-548 - "Cozy Caboose" is located on private property in Mount Shasta, CA. July 2012 photos by Lindsay Korst. X-549 is located at "Country Village" shopping mall in Bothell, WA. Photos taken in November 2001 by Lindsay Korst. 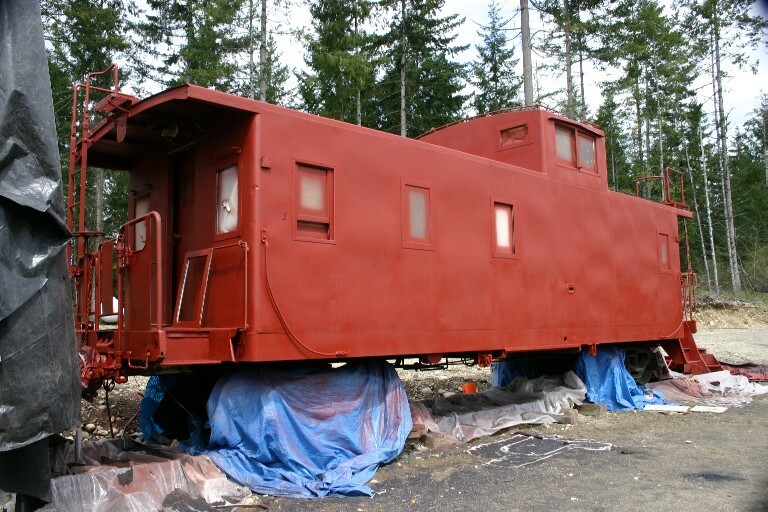 X-582 is represented here by two awesome shots by Jeff Haertlein of his lovingly-restored caboose. 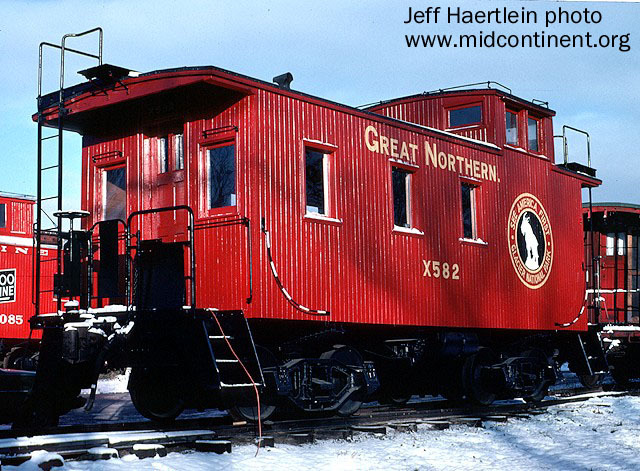 Located at the Mid-Continent Railway and Museum in North Freedom, Wisconsin, you can read more about this caboose in my Stories/Reports section. 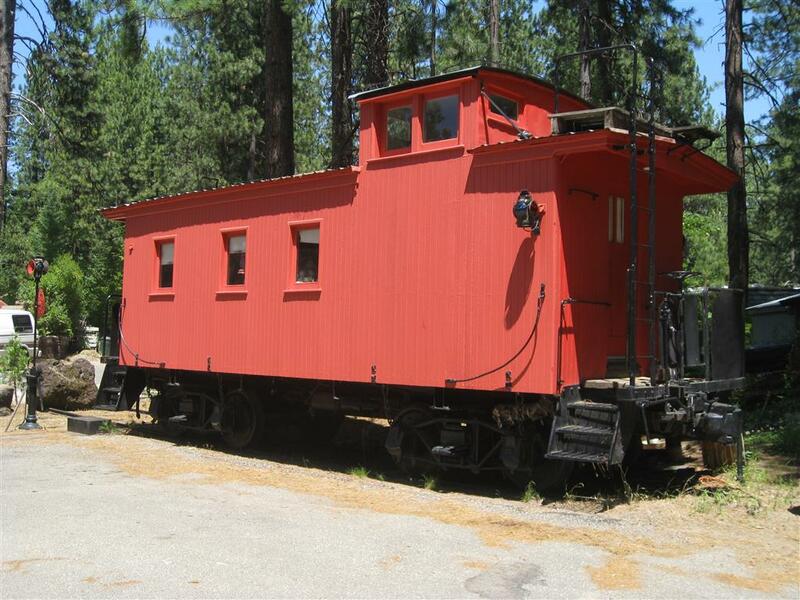 X-630 - Is located on private property in Dorris, CA. July 2012 photo by Lindsay Korst. 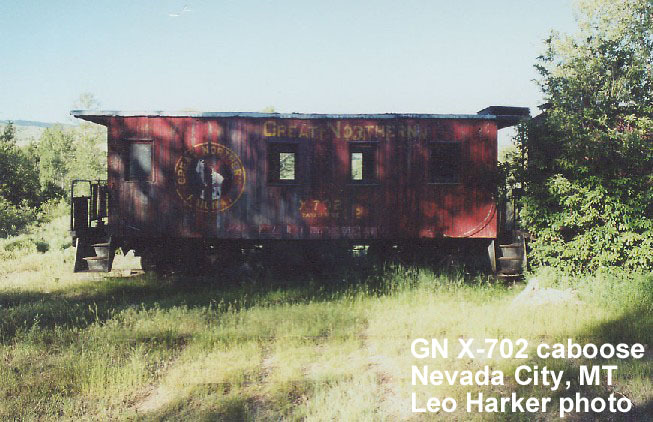 X-702 can be found at Nevada City, MT in this undated Leo Harker photo. 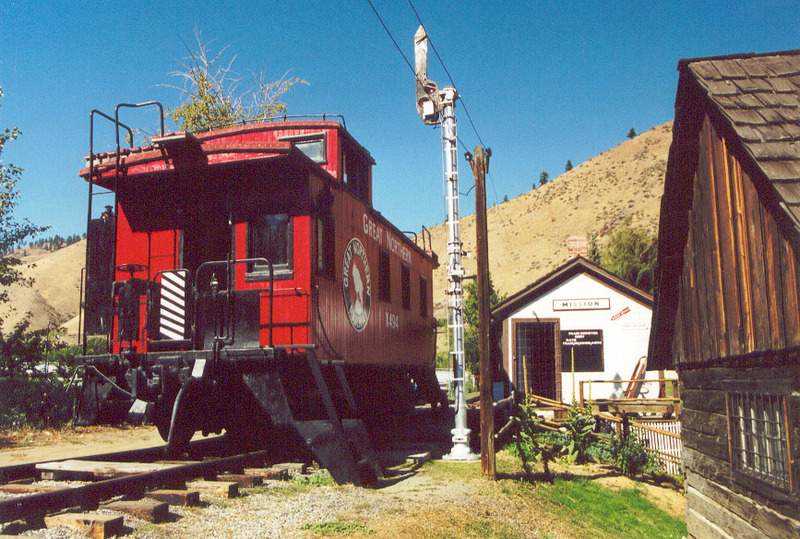 X-708 at Culbertson, MT museum east of town. July 2003 photo by Lindsay Korst. 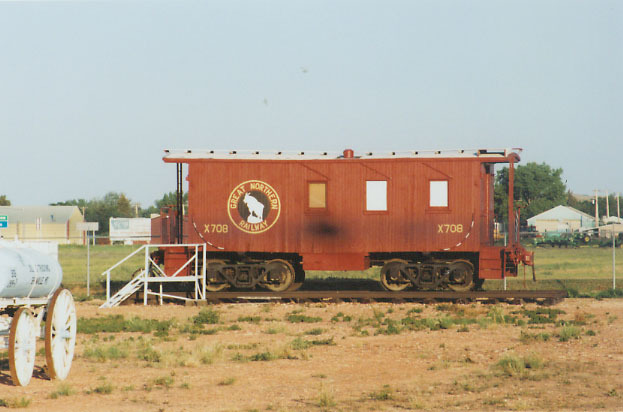 X-719 caboose just west of Melrose, MN. July 2003 photo by Lindsay Korst. 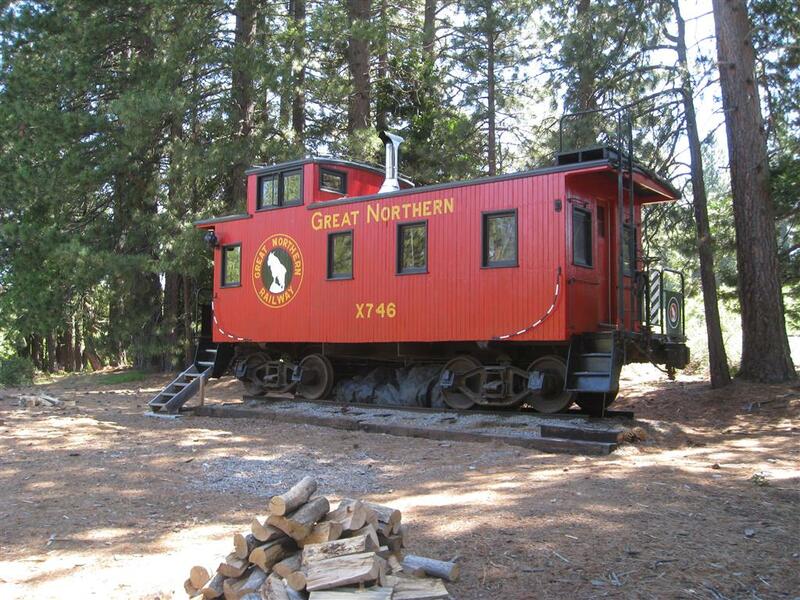 X-746 - is located on private property near Weed, CA. July 2012 photos by Lindsay Korst. 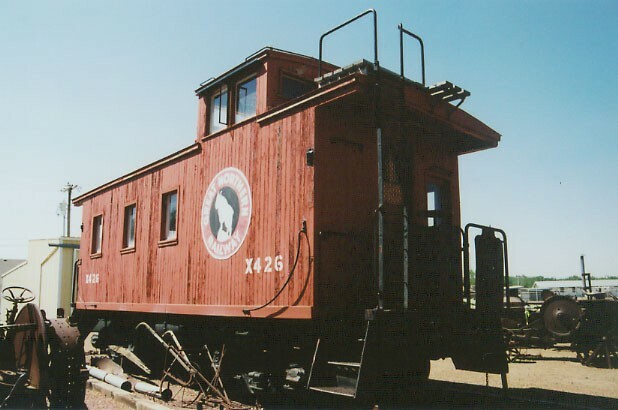 X-757 - Technically not a caboose, but a "drover's coach", the X-757 was originally used to transport cattlemen who followed their livestock to market. 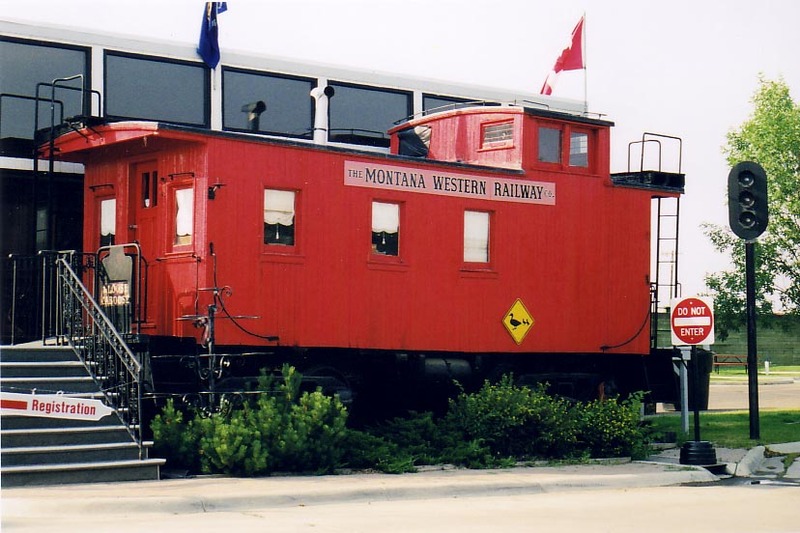 This beautifully restored stockmen's coach is owned by Jack Hoover and is located at the Mehmke Steam Museum east of Great Falls, Montana. Photo by Lindsay Korst taken July 1998. 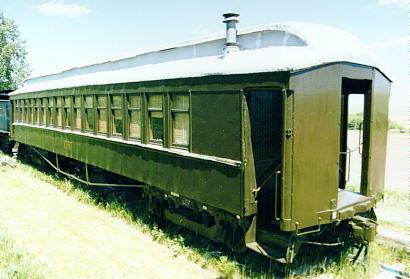 X-757 Update: This car has since been moved to the MTM Jackson St. Roundhouse. 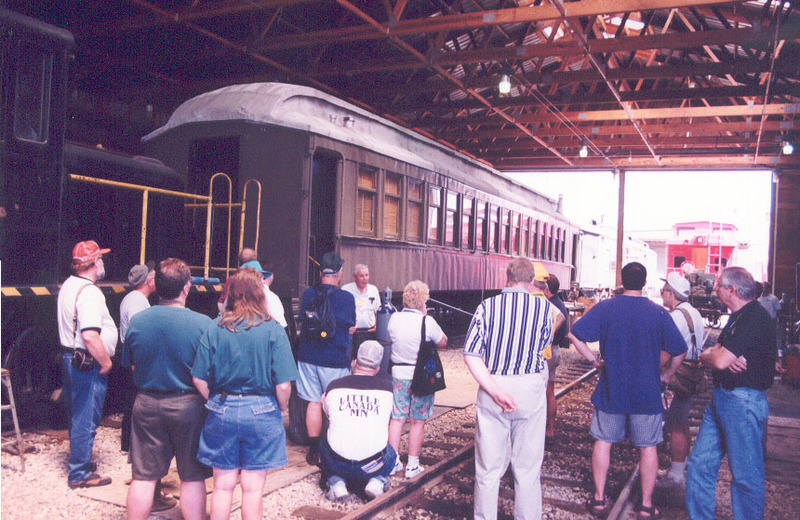 Jack Hoover is seen here (white shirt, center) talking about his beloved car. 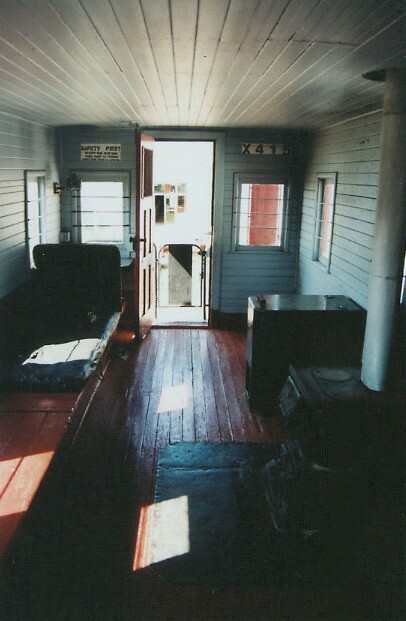 Photo taken by Lindsay Korst in July 2001. X-3006 near Priest Lake, ID. July 2004 photos by Lindsay Korst.